A photo tour of a restored northeastern tallgrass prairie with its spring-blooming native plants. Spring comes to the prairie with the scent of smoke. It is now generally accepted that optimum management of the prairie involves regular controlled burns. There are several reasons for this. 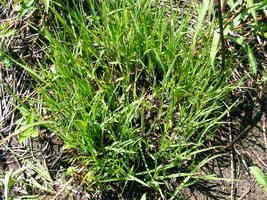 It reduces the buildup of dried grasses that can lead to devastating uncontrolled prairie fires. 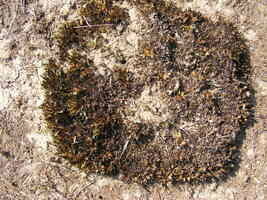 The resulting ash releases nutrients to the soil. And burning eradicates non-native weeds, brush and trees that threaten the nature of the prairie. 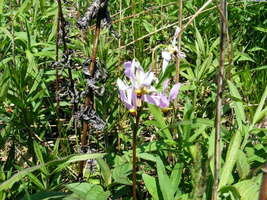 Native prairie plants have evolved the ability to survive frequent fires. Their roots go deep into the soil and they resprout rapidly. 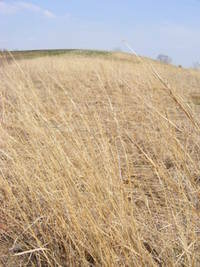 Because most prairie grasses and forbs are hot-weather plants, they are still dormant in the early spring, which makes this a good time for conducting a burn. 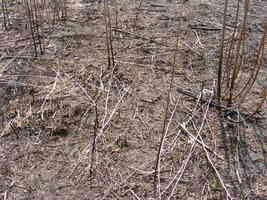 At first, the burned area seems lifeless and devastated, but new growth is ready to begin. It is astonishing to observe how quickly the prairie begins to recover after a burn. On the cleared ground, it is easy to see how rapidly the prairie reacts, as new growth sprouts everywhere, shoots bursting out of the earth. Within a week, the charred black is returning to green. 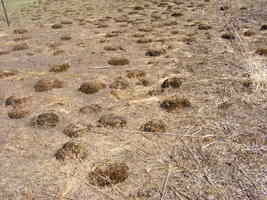 From burned hedgehog-like clumps, new sprouts of prairie grasses begin to emerge. 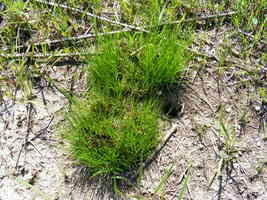 Many prairie grasses have a clumping habit, but the most prominent mounds are likely made by Prairie Dropseed and Indiangrass. 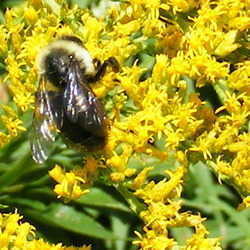 For most home prairie gardens, a burn is likely to be a "do not try this at home" operation. Local ordinances may forbid burning or require special licenses or the presence of the fire department. Controlled burns need special equipment - usually propane torches - that the home gardener may not have. 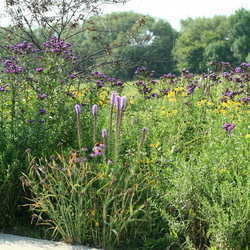 And for a smaller prairie garden, burning is not really necessary. 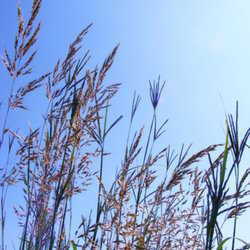 Dead grasses can be cut back by hand and invasive weeds can be pulled or cut out. In any event, the entire prairie is not burned every year; managers do one section at a time, which allows wildlife to escape the fire. 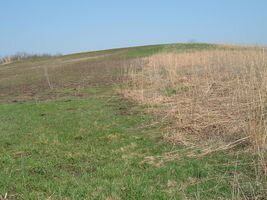 On the left is a photo of an unburned section of prairie, with dead stems of tall grasses still standing. On the right is where the burned area meets this section, taken about ten days after the burn. 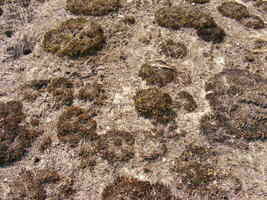 Already, the ground is green with renewed growth. 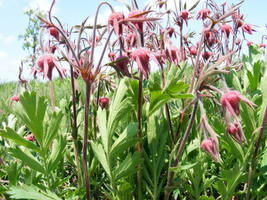 For most prairie plants, this vigorous spring growth will only reach its climax in bloom after summer heat arrives. Even where the prairie is not burned, there is little flowering to see in springtime, and to spot it you have to closely examine the ground, for these are the smaller, more subtle flowers with a low habit of growth. Yet by May [in zone 5] the flowering of the prairie has already begun. Gardeners interested in a prairie restoration garden will want to consider these native flowers to provide interest during this early season. 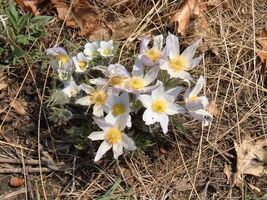 One of the earliest prairie flowers to bloom in the spring. 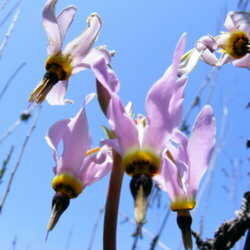 The plant is very low, with a single flower on each stem, ranging in color from white to lavender. 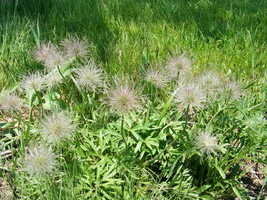 The bright yellow centers develop into an interesting feathery seedhead. Part of the rose family. 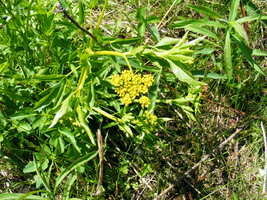 Stems about 1 foot high bear several small pendant, nodding flowers. 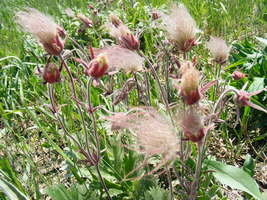 The name comes from the smoke-like plumes of the seedheads. Primrose family. These delicate small flowers come in both a pink and a white variety. The flower stalk, usually less than 2 feet high, arises from a low cluster of strap-like leaves, and the flowers hang downward, nodding. 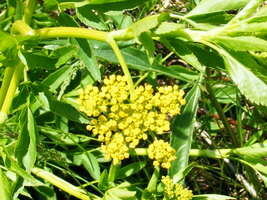 A member of the parsley family, one of the few golden flowers to bloom in this early season. More common in moist situations. 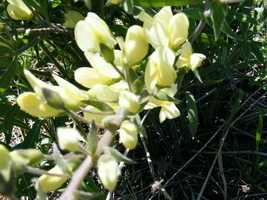 A member of the bean family, one of several species of wild indigo native to the prairie. 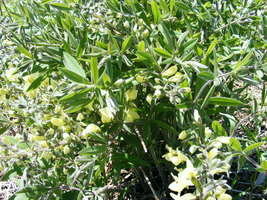 The typically pea-like flowers are in clusters on long stalks that seem to be drooping under their weight. Note: These are only a few of the prairie flowers that bloom in the spring, those that I have found flowering in the nearby prairies, the tallgrass prairie of Northern Illinois, in Zone 5. Prairie environments differ greatly, and not all plants will thrive in all areas. Most of these photos were taken in the Russell R. Kirt Prairie of the College of DuPage.